The Emory community is mourning the loss of Raymond Danowski, who contributed a vast collection of 20th-century poetry and related materials that has become a world-renowned resource for research and scholarship at the Stuart A. Rose Manuscript, Archives and Rare Book Library. The Emory community is mourning the loss of Raymond Danowski, a generous benefactor of the Stuart A. Rose Manuscript, Archives, and Rare Book Library, who contributed a vast collection of 20th-century poetry and related materials that has become a world-renowned resource for research and scholarship. Danowski, 74, died at his home in South Africa on Feb. 2 after a period of illness. At Emory, he will be remembered as the man behind the Raymond Danowski Poetry Library, a 75,000-volume collection of rare and first edition books, journals and other materials, considered the largest collection of 20th century English-language poetry in the world. 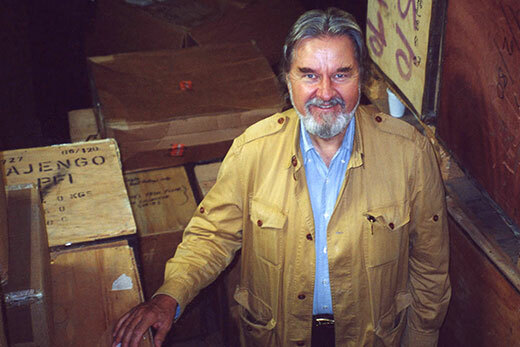 Danowski’s love of books and poetry started at a young age, and as an adult, he assembled the collection over a 30-year period without the use of a computer or filing system; the inventory of contents was all in his memory. As the collection grew, he first stored the books in a barn on his property, then in a warehouse. He knew he would need to find a new place eventually, and he had another goal – to share the collection widely with others. Known for his generous spirit, Danowski began searching for an institution to take on his collection, one that would give undergraduates and members of the public access to the rare books and materials. He had trouble finding a place willing to meet his requirement, until he met Ronald Schuchard, professor of English at Emory (now emeritus). Schuchard told Danowski about the university’s rare book library (now the Rose Library), its collections of poets’ papers, and its welcoming access policy (anyone can look at these primary materials upon request) – all elements that Danowski was looking for. The Raymond Danowski Poetry Library was established at Emory in 2004. The Raymond Danowski Poetry Library at the Rose Library contains first editions, chapbooks, photographs, typescripts, literary journals and correspondence, as well as other materials related to counterculture, the civil rights movement, Vietnam War and other 20th-century issues thought to have influenced some of the poets. The holdings come from the U.S., Australia, India, Canada, South Africa, Ireland, Scotland and other parts of the U.K. Researchers have traveled from many of these same countries to use the collection. Some of the most notable items include a signed first edition of Walt Whitman’s “Leaves of Grass,” issued anonymously by the author in 1855; a first edition of T.S. Eliot’s “Prufrock and Other Observations” (1917), inscribed by the author to a close friend, and Anne Sexton’s personal, annotated copy of Sylvia Plath’s “Ariel” (1965). Materials also include more than 50,000 literary journals, several thousand broadsides, recordings, unique manuscripts, ephemera and other objects. It is a living library, regularly expanded with new acquisitions, publishing efforts, digital projects and exhibitions. The collection inspired the Raymond Danowski Poetry Library Reading Series, which over the last 13 years has drawn distinguished poets such as Rita Dove, Seamus Heaney, Natasha Trethewey, Elizabeth Alexander, Paul Muldoon, Sonia Sanchez, Galway Kinnell and many others to the Emory campus to read their works. In 2016, Emory recognized Danowski with an honorary doctor of humane letters degree at commencement, and the Rose Library named a seminar room for him when it opened its newly renovated space in the fall of 2015.